Photographs such as these are taken for the participants to purchase and have a memento from the event. I forced myself to look at them because if I'm going to spout off about the horror of donkey team roping, it's incumbent upon me to understand it as best I can. But the more I looked at the photographs, the more I can't understand. I can't understand why anyone would want to do this, watch this or condone it on any level by their involvement. I see George's and Alan's and Lucy's faces on the donkeys in those photographs, and it just brings me to tears. The link to the donkey roping photos is being shared by more and more folks over on facebook; lots of blogs are picking up the story; and you wonderful people are writing e-mails, contacting animal rights and welfare groups, and telling everyone you know about this ridiculous "sport" and upcoming event. There are nine days left before the World Championship Donkey Roping, and who knows? Maybe the power of social media will help convince the organizers, sponsors, and presenter to call it off. An online petition against the event has been started over at change.org. Here's the link if you'd like to sign it. If you've gone over to look at the donkey roping shots, maybe you can force those out of your memory with the pictures below. ...and in the comfort and safety of those who love and care for their gentle souls. Dammit, I can't sign the petition, probably because I'm outside the US. The pic on that page made me want to cry, then seeing George and Allan made me want to cry even more. But thank you, Linda, for posting soothing pictures. This stuff is so upsetting. I don't think I can look at the donkey roping photos, but I have sent emails and I'll go sign the online petition. Just signed the online petition. Perhaps with enough "noise" they will have to pay attention to this issue. Hope springs eternal! Carson..this just broke my heart. One of the little donkeys had a brand that looked like a dollar sign. These people are SAD. One of the prizes was Tito's vodka...another a pony. That's a scary thought. Carson, I, too, will sign the petition, but the photos just brought me to tears...HOW can this go on? I couldn't stand to look at all the donkey-roping pictures, 7MSN!!! Such an inhumane sport!!! Thanks for posting pics of your sweet donkeys...so well-loved. Oh, and I signed the petition. My sister posted of this on Facebook and she and I both e-mailed the town of Van Horn's chamber of Commerce. Thank you for taking a huge interest as well and getting the word out. I can't look either. I did take a close look at the Vanhorn poster; apparently they have a goat roping contest too. And why have I never worried about calf roping? Isn't that a 'cowboy' tradition? And now I ask myself, why? Or perhaps, why still? This type of roping MUST be an embarrassment to a rodeo cow-roping cowboy. What kind of a challenge and display of skills would this show roping a donkey??? My heart bleeds for these gentle creatures! If these cowboys would only know what a SISSY this makes them look like! I’m sure that these so called cowboys sit when they go to the bathroom, too. While I cannot bring myself to watch the attachments. I signed the petition & shared on FB. Love the pics you posted. They made me smile! I sent an email from me, my dgd and my dh from different email addresses. I couldn't look at the pictures as I knew it would put me in a very bad mood. 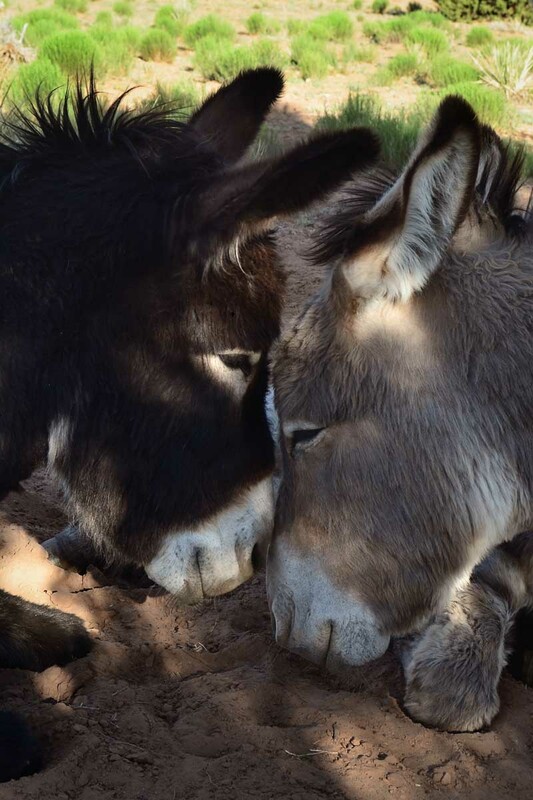 Thank you Linda and Justina for saving the donkeys you have and giving them such wonderful, loving homes. I'm in Canada and I was able to sign the petition. It seems there is a list from around the world so I think you can Sigrid. This will work! It has to! Tis done!! I've signed the petition AND left a comment!! I would sign it, but I donot think outside of the US signatures would be considered eh! I cannot look at those photos, I will just enjoy looking at the 7MSN gang and thank God they have good home!! p.s. Who are the sponsors? I would LOVE to send'em an email about my displeasure about them supporting animal abuse eh!!!!!!!!!!!! The close up of George and Alan is a terrific counterpoint to the cruelty of donkey roping. This shot would make a great cover photo for your next calendar. George and Alan look like they're praying. Probably all the safe equines pray for their helpless kin. I signed and posted it on Facebook. Thanks for helping to keep the momentum going. This is a barbaric sport at the expense of innocent animals. This should be classified under inhumane treatment and abuse of animals. We have to be the voice for these animals that have none. The pics of not only the donkeys but those poor goats being carried by one leg disgusts me. Something has to be done to stop this. Sigrid, just click Outside US, and if you can't find your land code, just choose one. I had to stop half way through the pictures, when the pics of the goats beeing roped and hauled came up. And this is grown men we're seeing here. That picture of George and Alan is just so beautiful. Cannot make myself look at the other photos. Thank you for the information. I sent a letter yesterday and signed the petition today. What is wrong with these people? How inhumane and apparently illegal this barbaric "sport" is. The big tough cowboys teaming up to rope innocent donkeys and traumatize them for life...if they live. How cowardly. One of the worst things I got from these pictures is they are teaching children to do the same thing by example basically perpetuating the abuse for generations to come. I couldn't look at the pictures, but I signed the petition and sent the link on to 15 email friends and some of them have donkeys and may not know about this cruel "entertainment". Hopefully we can get this stopped before it happens in nine days! Here is another one you might be interested in. It's to stop government funding for inspection of horse meat. Couldn't get the petition thingy to work, but did send an email. I have a hard time realizing such animal cruelty for "entertainment" is still legal. I know I don't want to look at the pictures, already upset enough after reading how they use cattle prods to shock the donkeys to get them to run. Knowing my donkey he would stand his ground first and kick, that would mean any donkeys like him would be shocked repeatly before they are roped. I think this deserves national news attention, anyone have connections to make it happen? George and Alan will have me smiling all day too. Just found your block through Bow Street Flowers and don't expect to ever leave this page, except to go sign the petition. I won't look at the other pics, can't do that to myself. I'm in love with Wynonna! I didn't look at the photos. I don't need to see them to know how evil it is! I signed the petition and emailed. I went, I saw, I cried, I ranted, the dogs and cats ran away from me.....but I'm better now. 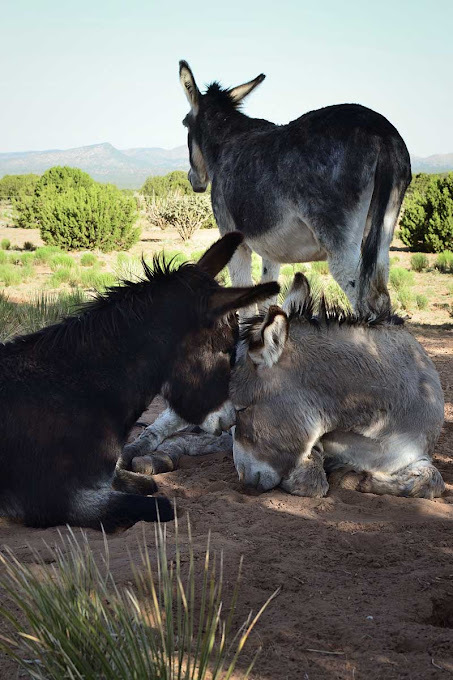 It's hard to think anyone could do anything like the cruelty that is inflicted on such loving animals as donkeys. Rodeo used to be showing off skills that one needed to ranch, not anymore. The rodeo of today has nothing to do with anything other than ego, pain and abject terror for the animal paricipants. Now that I have the picture of your sweet donkeys in my mind, I'm gonna try to focus on the good thoughts and leave the others. Thanks Carson, thanks MBF and all the other lovelies who love donkeys and let us love um too. Oh, I really wish that I hadn't looked at those photos. This is awful-just awful. I really pray that all this publicity will get them to cancel the event. It has to stop! My husband says it's a good thing we can't own guns in Canada..because I would always be out of bullets..... I'd love it because I'd keep people on their toes.....and damn well looking over shoulders....somebody please give me a gun. ... and plenty of bullets. I'm chilled to the bone... and the goats!!!! I'm off writing an e-mail! Such sweet photos you have. If I had my own farm, I would get two of these sweet animals. it is hard to think someone can call this fun, these men need to realize this is abuse. it is as bad as the mexican rodeos, the animals there are hurt badly too. Thank you, thank you, thank you to you and many of the other donkey blogs for stepping up and writing about this, giving us information and ways to get involved. Just signed the petition - keeping my fingers crossed. This photos you posted today just say it all. Any chance that I could get high resolution versions of both? I'd also like one of the first photo posted on June 7 of George (I think) with a piece of grass in his mouth. I don't know how much trouble it is to provide these, but I'd really appreciate it. Thanks. I wanted to look, but now you need a password to enter the site.